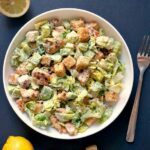 Grilled Chicken Caesar Salad with avocado and a healthy yogurt dressing, a healthier version of the classic caesar salad. 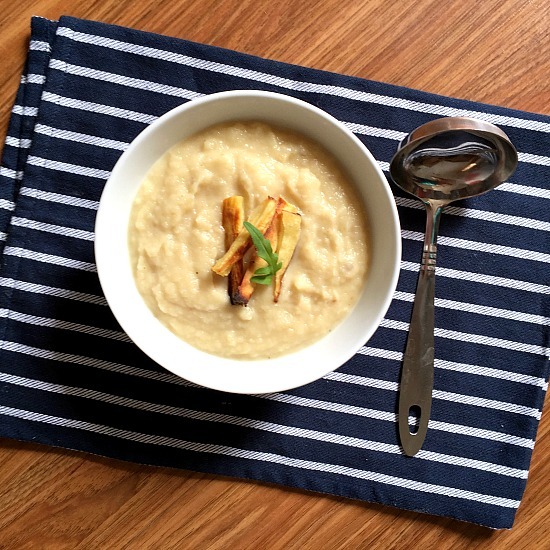 Super quick and easy to make, this is a great recipe for a work lunch or light dinner. If you like the classic Caesar Salad (and it’s indeed delicious), you will love this lighter, healthier, and super yummy grilled chicken avocado caesar salad. As much as I like mayo, it’s not quite the healthiest option if you want to enjoy a guilt-free salad dressing. It does make it richer, more flavourful, but also heavier, and it kind of defeats the purpose of eating a salad. I mean, salads are supposed to be healthy, right? So I swapped the mayo for Greek yogurt, which is super silky, and brings a subtle creaminess to the dressing. Forget about store-bough packed caesar salad, it’s rather expensive, and nowhere near as tasty as your homemade one. What ingredients go into a Caesar salad? The very basic recipe calls for lettuce, crutons, parmesan, dressing and seasoning. Simple ingredients, but together they make one of the most delicious salads. And making it at home it’s super easy and quick. I absolutely loved this salad, and it tastes just like the real. 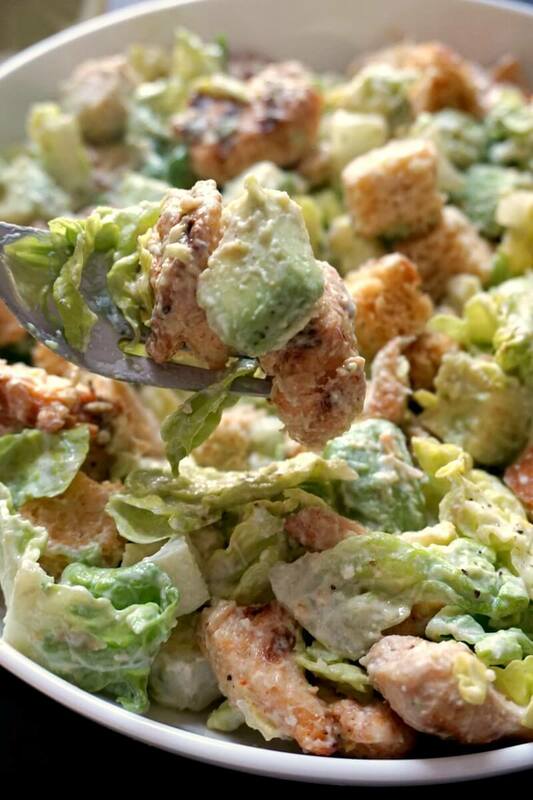 How do you make a grilled chicken Caesar salad? If you want to add chicken to make the caesar salad more filling, and even more delicious, grilling it is the best (and healthiest) way. Cut the chicken breast into chunks, add them to a re-seable bag together with the garlic powder, paprika, salt, pepper and olive oil. Shake well to coat evenly, add to a heated grill pan, and grill for about 6-7 minutes until the chicken is cooked through. 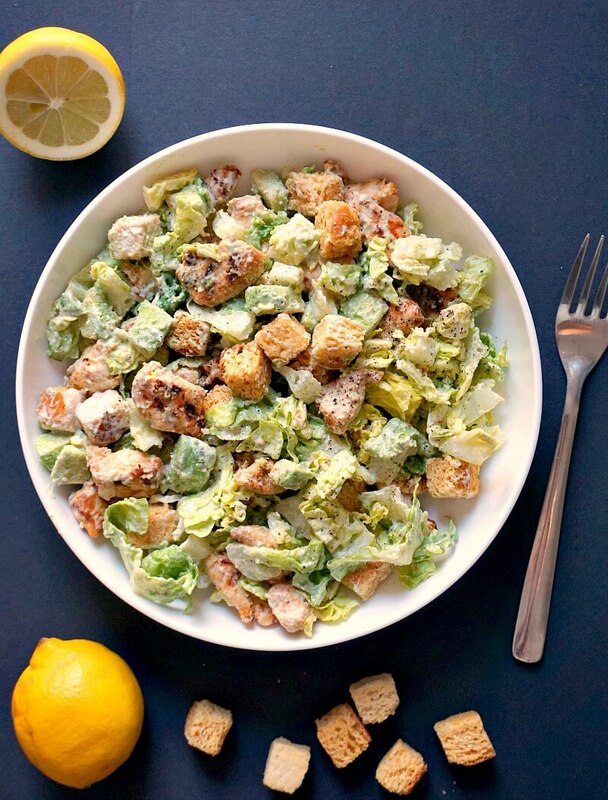 All is left to do is add the chicken to a bowl together with the lettuce, avocados, croutons and dressing, and one superb salad is here for you. How do you make a healthy Caesar salad dressing? Now, that’s simple. 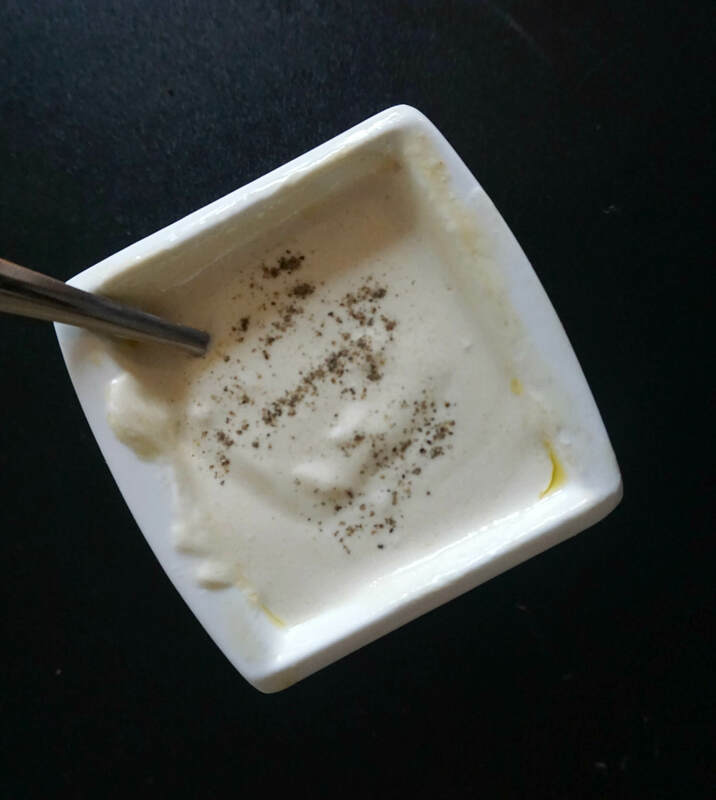 All we need to do is mix all the ingredients together: Greek yogurt, olive oil, lemon juice, Worchestershire sauce, minced garlic, black pepper and parmesan cheese. The sauce is tangy, sharp, but creamy at the same time, and it goes wonderfully well with the crispiness of the croutons, the freshness of the lettuce, and the tender grilled chicken. I think the dressing has the right amount of sharpness, but anchovies can be added too for that extra kick. If you’ve tried my HEALTHY GRILLED CHICKEN CAESAR SALAD WITH YOGURT DRESSING or any other recipe on the blog then don’t forget to rate the recipe and let me know how you got on in the comments below, I love hearing from you! You can also FOLLOW ME on FACEBOOK, and PINTEREST to see more delicious food and what I’m getting up to. Healthy Grilled Chicken Caesar Salad with avocado and a light yogurt dressing, a healthier version of the classic caesar salad. 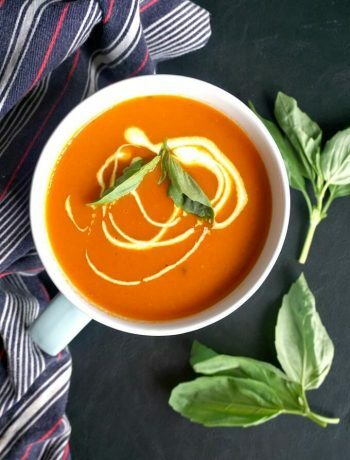 Super quick and easy to make, this is a great recipe for a work lunch or light dinner. To cook the chicken, cut the chicken breasts into chunks, add them to a re-seable bag together with the olive oil, paprika, garlic, salt and pepper. Shake the bag well to coat. 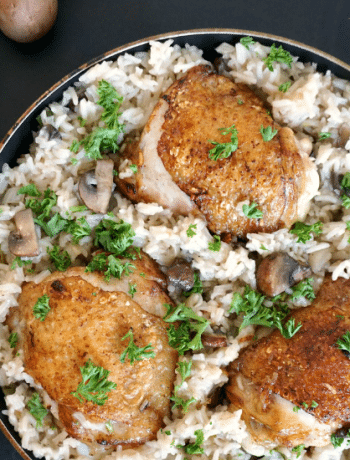 Heat up a grill pan, add the chicken pieces and cook for 6-7 minutes until cooked through. 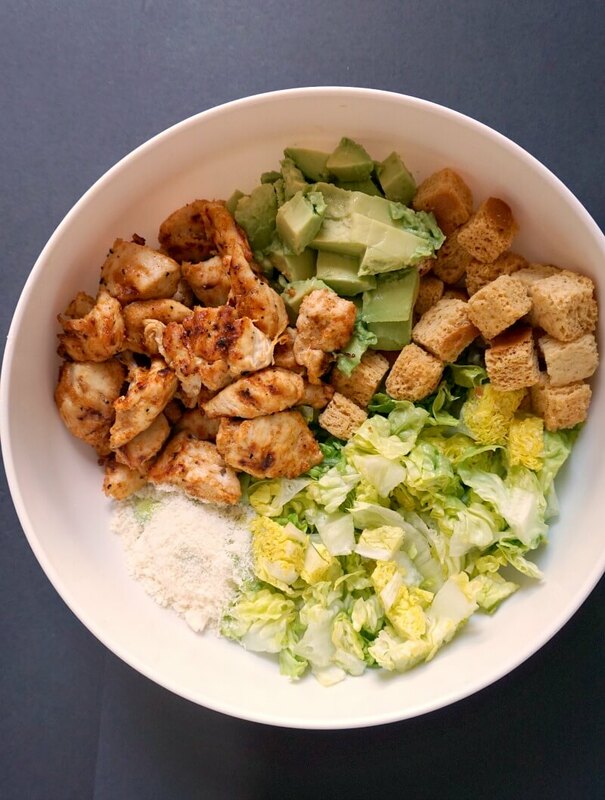 Shred the lettuce and add it to a bowl together with the chopped avocado, croutons, cooked chicken and half of the parmesan. To make the dressing, combine the yogurt, olive oil, lemon juice, garlic mince, worcestershire sauce and pepper. Drizzle it over the salad, and toss well to coat.